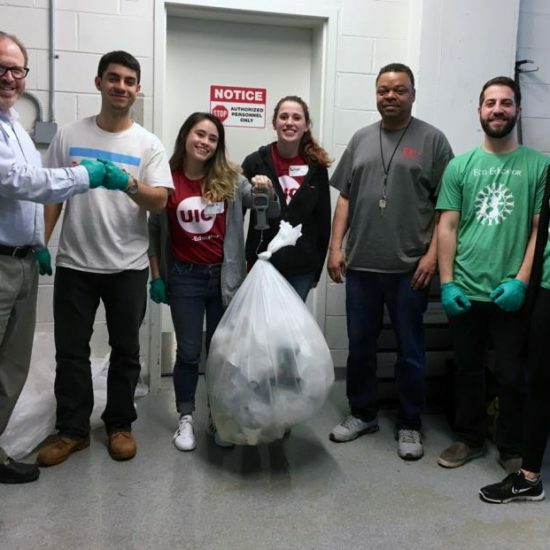 UIC is committed to Zero Waste and we need your help! Recycling is required by Illinois Law and is one of the easiest ways you can help the university be a good environmental steward. We must reduce the waste we produce by choosing materials wisely; reuse what we have already by considering new roles for unwanted material; and recycle what must be thrown away, thus minimizing material bound for the landfill and increase our landfill diversion rate to 90%! Here you will find what and where you can recycle on campus, more sustainable alternatives, and information about zero waste events. This recycling tutorial will walk you through the steps of what and how to recycle at UIC in less than 5 minutes. 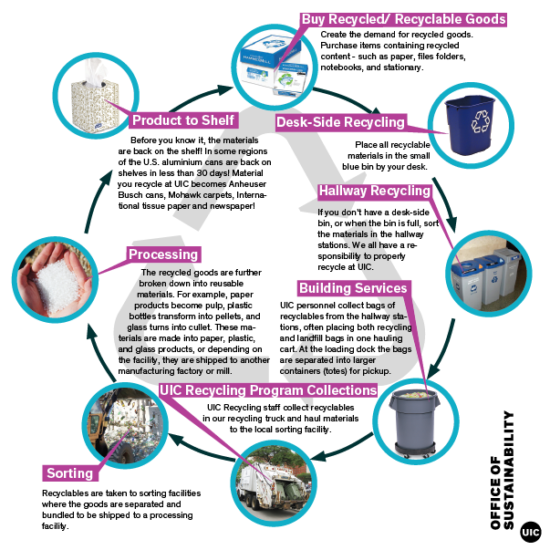 What materials can be recycled at UIC? Recycling stations of different shapes and sizes can be found in the hallways in every building at UIC and should be no more than a few steps away from your office, classroom or lab. These stations usually consist of three bins (“Paper”; “Bottles & Cans”; and “Landfill”). You can recycle paper, broken-down cardboard, empty containers of glass and metal, and all plastics with a number except #6 PS (polystyrene). Buildings with laboratories also have collections for pipette tip boxes, which are #5 PP (polypropylene) plastic. Certain buildings on campus also have collection bins for batteries, writing utensils, and plastic bags (and other plastic “film”). How do I recycle at UIC? If you work in an office, you should have a small, blue or grey bin for paper recycling and an even smaller black or grey bin for landfill material. You can empty the blue, desk-side recycling bin it into the larger hallway or common area bins whenever it is convenient for you. A Building Service Worker (BSW) will come through to empty the hallway bins. Don’t be alarmed if you see the BSW place all bags into one cart – they will separate the bags into the proper containers in the dock area of your building. If you need assistance obtaining recycling bins for your office contact us at the link at the bottom of the page. The Great Stuff Exchange (GSX) is an office supplies giveaway program. 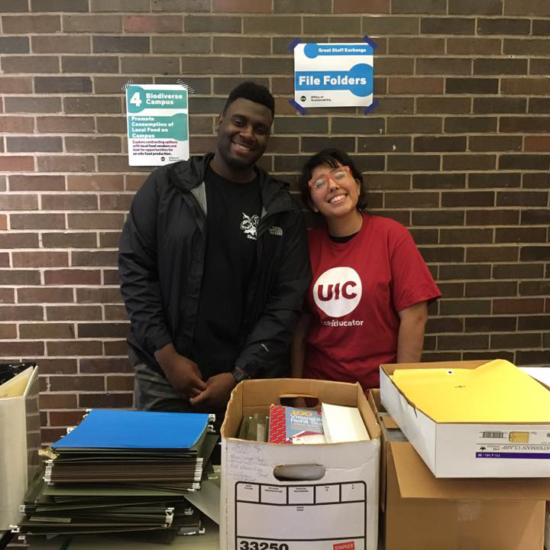 UIC collects items like binders, desk top filing systems, and other office supplies form departments that can no longer use them and makes them available for students, staff and faculty – for free! All donated items must be in clean and working condition. 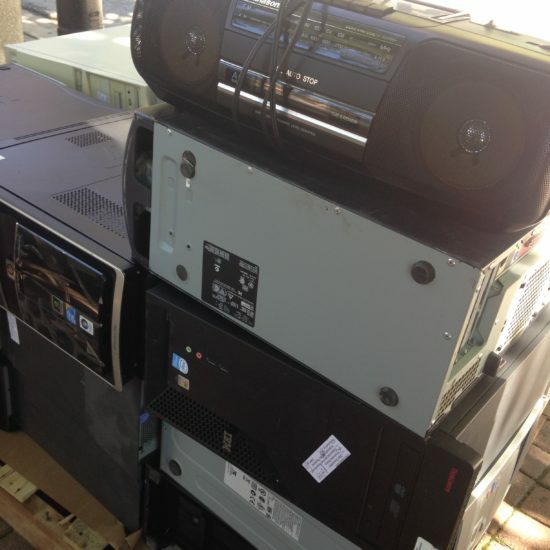 Each September, there is a centralized collection event for university-owned electronics. Simply fill out the appropriate paperwork, bring your items and a copy of the FABWEB disposal request, and we will make sure it is recycled properly in accordance with the Illinois Electronic Products Recycling and Reuse Act and the OBFS Equipment Disposal Methods. 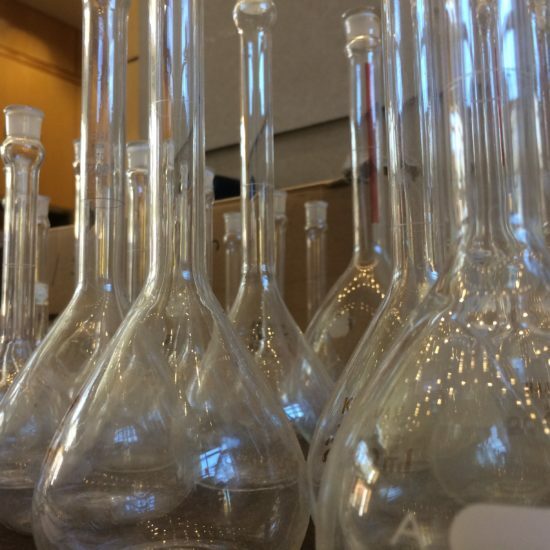 UIC accepts donations of unwanted – but working – laboratory materials especially glass flasks and beakers, and plastic pipettes and centrifuge tubes. The LabShare program also accepts equipment without university property tags (“P-Tags”). Researchers may request these items for use in the lab. A Zero Waste event doesn’t have to be that hard! One of the most critical things in zero waste planning is assuring that 90% of your event’s waste is diverted from landfill. This means reusable, compostable, or recyclable materials are used when needed, You are also participating in resource recovery for donating untouched, packaged items. Carefully differentiating between each material and recognizing the exact materials used may seem like a lot of work, however, we are here to help you through your zero-waste event planning. 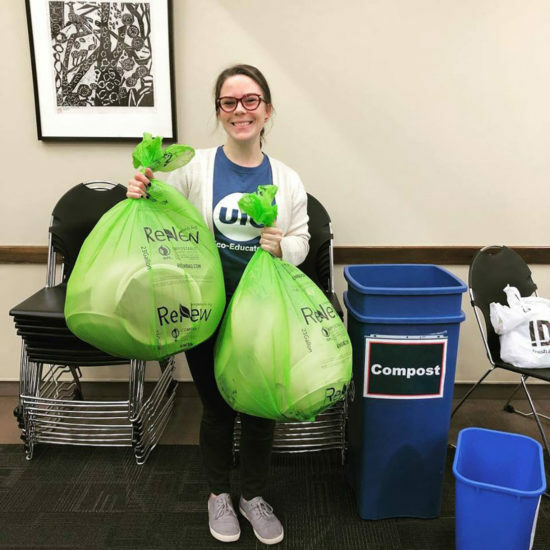 The UIC Zero Waste Planning Guide includes a case study for an example, definitions, a list of operations to be done before, during, and after your event, and a list of sustainable resources. With careful, thought-out planning, zero waste is easy and sustainable! 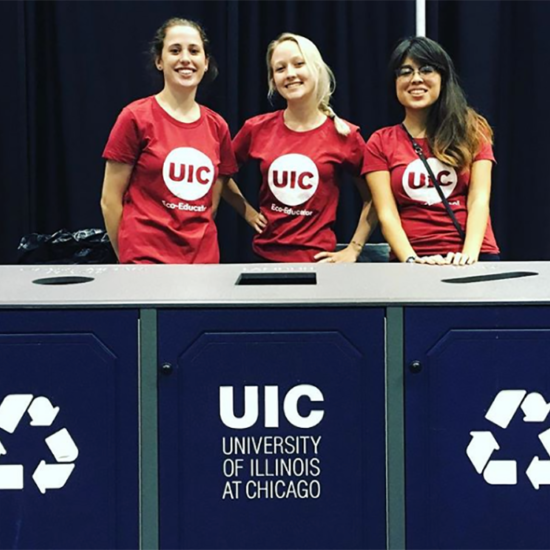 Check out this page for resources how to create a zero waste event at UIC! It all starts with smart materials. It begins when the materials available for use on campus are chosen based on compatibility within our recycling program. If an item (for example, Styrofoam cups) is provided for use on campus, it is everyone’s responsibility to ask why it was chosen in the first place. Choosing materials with more recycled content helps the economy and the environment. Questions about the Recycling Program? Contact Us!